As with many people, I have an inexplicable interest in Tibet (well, perhaps most other people can explain their fascination). But, I do not have much of an interest in Americans who travel to far-off lands to "find" themselves, become all consumed in Buddhist (or other religious) traditions, and then return home to write books or otherwise look down on those of us who have not been similarly enlightened. Despite this, I find that I continue to read these books, if only for the vicarious thrill of traveling to these far-off lands. And perhaps, the hope that I will also be inspired to someday find myself. 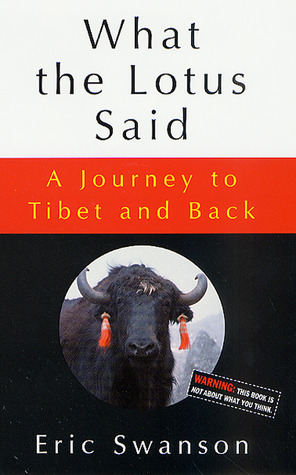 The author of this memoir claims that his journey to Tibet and back with a Tibetan lama and several other Americans is "not about what you think." I'm not quite sure what he thinks I thought it would be about, but I found this to be a pretty typical attempted journey to enlightenment book. The one thing Swanson doesn't do is describe Tibet as overly picturesque, or pull punches when it comes to describing the sketchy hostels he stays in or the long arduous bus rides he endures. The reader does not get the sense that Swanson has fallen in love with Tibet and its inexplicably magical ways - and I did appreciate that sense of honesty about the experience. The book is written in a fragmented way that is, I believe, supposed to mirror the writing in the Tibetan Book of the Dead (which I have not read). Rather than coming across as wise or insightful, however, it just struck me as a pretentious attempt to sound wise or insightful and it did not work for me. For me, the attempts at humor through the book failed, and just came across as flip and disrespectful to the culture he was allegedly trying so hard to become one with. My long-distance love affair with Tibet continues, however, and I remain in search of the memoir that will get it right for me (maybe I should just book a trip for myself soon). The story of a humanitarian mission to Eastern Tibet, far from the tourist trails. The beauty and squalor of backcountry Tibet are vividly described, as are the tantalizing insights and medieval severity of Tibetan Buddhism, and the author's unfulfilled longing. Some interesting views on modern life in Tibet and how religion continues there in spite of China's efforts to wipe it out there. Ending was a bit odd though.